Disassembling a deadbolt lock is a necessary step when replacing an old deadbolt lock with a new one. 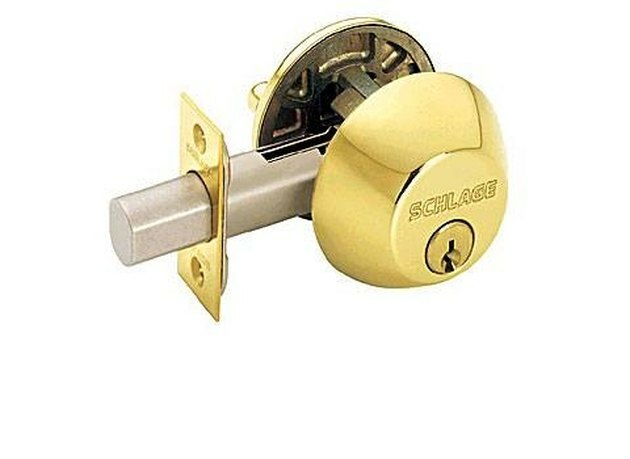 It is a good idea to pay attention to what you are doing to remove the old deadbolt if you are replacing it with a new deadbolt of the same brand. Even if you are switching brands, most deadbolts assemble in similar ways. The differences may be minor, so if you are replacing an old deadbolt, disassembling the existing deadbolt will be the reverse of installing the new one. Unscrew the deadbolt mounting screws from the inside of the deadbolt with a Phillips screwdriver. Pull the thumbturn unit away from the inside of the door, followed by the outside cylinder unit from the outside of the door. Note: Place the parts removed from the door and the door jamb onto a cloth rag. Thy may be pretty grimy from their years of use. Remove the adapter ring with the screwdriver if there is one present. Remove the screws from the deadbolt latch faceplate on the side of the door with the screwdriver. Pull the faceplate off of the door. Then use the screwdriver to pull the deadbolt latch assembly out of the door. Unscrew the strike plate from the doorjamb. The strike plate may be stuck to the paint so use a screwdriver to help remove the strike plate, if needed. Wipe the grime from your hands with a cloth rag until you have the opportunity to wash them.